Would appreciate any comments on my trading plan. Thanks all. I took a short on GPBJPY the other night but I cancelled it - turned out I would’ve made money. On the D1 - several days ago there was a BUOVB but there are 2 bearish PA signals over the past few days. Bearish pinbar yesterday and a couple of days ago there was a BEOVB. Pinbar was formed around SR and beneath 8 21 EMAs. So there’s a lot of resistance in this area. BEOVB also formed between Psych resistance of 1.140 and SR line. 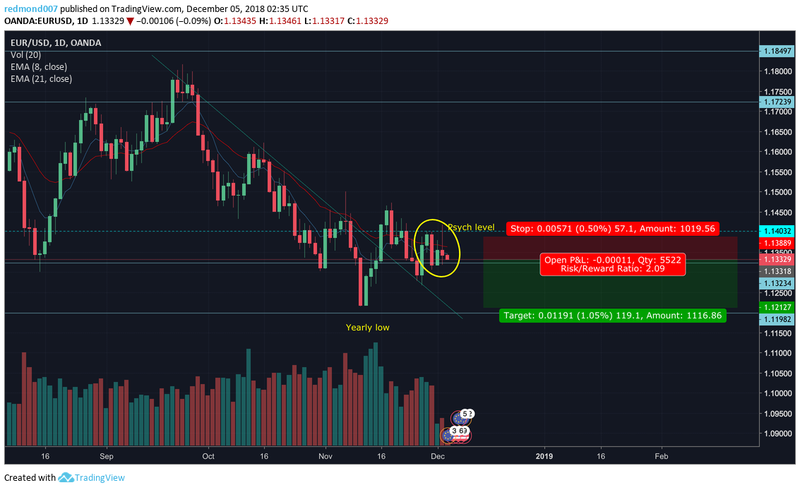 Price is really being squeezed in this area, but this is clearly a bearish trend with market uncertainty around Brexit and strength of USD in last day against EUR and GBP. I only see price going down in the near future. Price has already broken first SR a few times, nothing to impede it from reaching yearly low SR. I’m not good at rating a trade, I’ll give this one a 3 star due to double PA.
You were right to go short, and its still a good call across daily, weekly and monthly. This is another good call. I’m short on it as well. This is what I see on the daily. The trade turned against me last night during the London session, which is not surprising to me. I have not been paying close enough to fundamentals - I was counting on the price reversing and going back in my direction during the US session today but I did not know that it’s a trading holiday today in the US due to the death of former President Bush. So US bears cannot save me today. I have to hope that the price does not hit my SL before trading in the US market resumes tomorrow. SL hit. 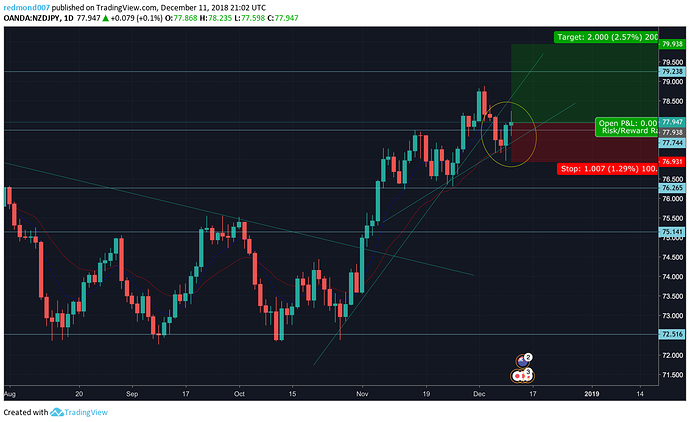 I still feel I took the right trade from a PA perspective, and this trade was according to my trading plan and how the PA signals were defined by the james 16 document - please comment if you feel otherwise. I did not take into account fundamental events and how they could play into the market. And how subtle interpretations of fundamental events such as - trade war ceasefire for US and China first being interpreted positively then with skepticism, Theresa May’s Brexit plan likely being rejected, announcement from EU lawyer that UK could revoke its Brexit announcement, and things like - slowing down of US yields. There are a lot of fundamental elements that effected this trade. On D1 - bearish pinbar and BEOVB. Definitely rejection of SR, but price currently being squeezed between trendline and SR. I like this trade right now because doesn’t involve EUR GBP or USD, a lot of chaos and uncertainty especially after disappointing ADP. If price is really going down - then even more attractive because now may be a retracement entry opportunity. The BEOVB and pinbar are not 5 star because it’s not clear we’re at the end of the bullish trend, although looks like it could be - definitely bearish volume lately. Also looks like a bearish move in Bollinger Bars. From a fundamental perspective - CAD is losing ground as currently oil prices are uncertain, hawkish BOC announcement may trigger bull move. 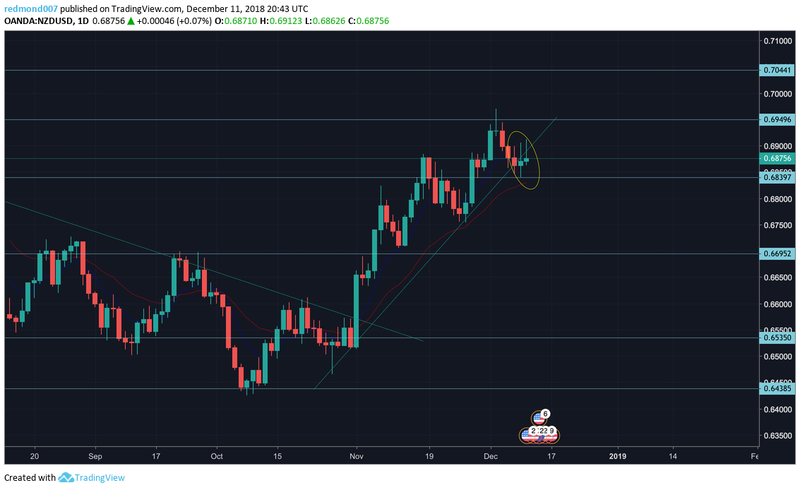 AUD is tied to China due to close trade relationship. Would not be that great of a trade opportunity - maybe 2 star. Because bullish trendline, EMAs and H1 resistance are in the way. CAD bullish after positive news with Opec Oil deal helped me. -I took 3 trades - if I followed my instincts and not closed the first I would be up right now. I think I got nervous on that first trade but I think it was valid. The second trade EURUSD - I think I got bit by some turmoil in global politics. Brexit stuff, trade war nervousness between US and China, some fears around US bond yields, and then a bank holiday on Wed. I think my PA system is pretty sound overall though. -Pay more attention to daily FX news. Make sure your perfect PA is not falling in some unexpected situation like NFP. Did a ton of programming in Pinescript and Python over the weekend fyi. 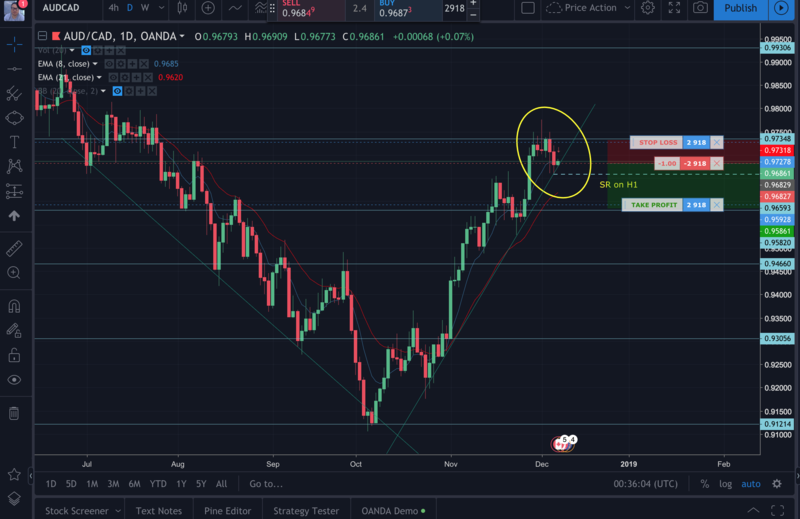 I particularly liked reading about Jon V’s algorithmic trading and machine learning platform built in Python and the Oanda API at GitHub - jonromero/forex_algotrading: My Forex algotrading platform in Python - based on my posts at http://jon.io . Good stuff I’ll be looking at more in the next few weeks. BUOVB formed on D1 in an uptrend. Along trendline , SR and EMA’s. So there is support and PA, and we are in and uptrend. Problem is a lot of uncertainty right now with US China trade war and US yields underperformance and fears of recession. 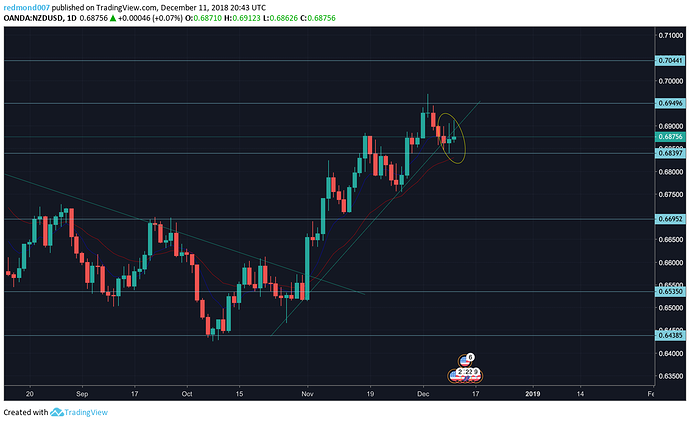 Continued good relations is good for NZD. There is not a lot of conviction in the market in the form of volume around this PA. The pair seems undersold on the H4 chart, but a lot of bearish volume. My fear is that it may take several days to make that TP level - and there may be fundamental events that change the conditions of the trade before it hits. I would rate this a 2, although I’m not sure about this. Could be a better setup. It’s supported by SR(? ), trendline, and EMA’s. Nothing to stop it from reaching TP at next SR zone. My fear is that I’m trading just to trade. Also - this conforms to my trading rules, but political situaton makes it a little risky. Confirms bullish bias, not sure if that will help this trade though. We had a bullish move last night, but price pushed down again today. On D1, BUOVB and a bit of a retrace right now may be a good entry. BUOVB appears on trendline, EMAs, and around SR area. See "NZDJPY TREND CONTINUATION" by trader BlueberryMarkets — published December 11, 2018 — TradingView Risk on in EUR last night after positive jobs report. This trade meets my rules, I only take 1:1 RR right now because I’m still not that confident. also, there is the 79.23 SR which may prevent it from hitting my TP. Decided to take the trade with a lower RR ratio - and some worries that I may be trading too much. Also some worries that I’m taking this trade at a time when I have some high anxiety levels, it does meet my requirements though. Rating would be a 2-3 due to SR zone. I closed both my trades. I know i violated my trading plan. NZD seemed to be really struggling for a couple of days now, despite weakness of dollar. I didn’t like 3 pinbars in a row. I know I should’ve let it play out to its conclusion. I don’t want to be in the red again with my account. Right now I made about $1 on my accounts. If these trades turn out to be winners in the next couple of days I’ll be kicking myself. I know I’m not sticking with my plan. After I am in a trade I will not move my Stop Loss unless it is in my favor. I will manually exit a trade if I determine that it will not go in my favor - I must document my justification from exiting trades prematurely. 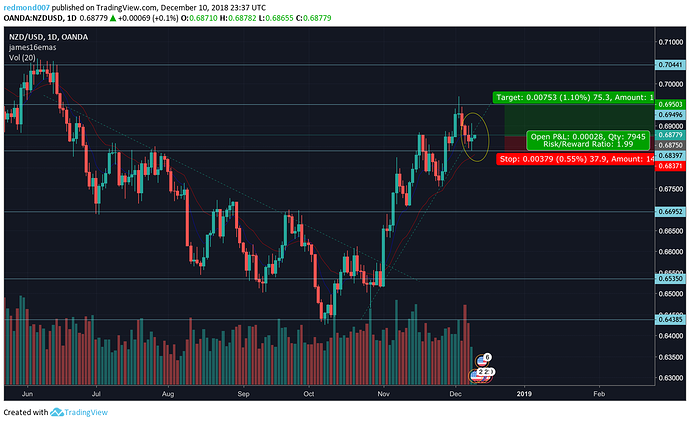 It turns out I was correct in exiting my trades yesterday as NZD pairs have continued to decline. Overall I broke even this week, I made about 2 bucks after closing out my trades early. I took 2 trades - I closed them out early for a small profit after I saw they were not going to go my way and was correct. I did a lot of programming, and am currently writing out scripts for a couple of people on Tradingview. End of the year - last 2 weeks - high volatility, low liquidity - not necessarily best time to trade. It’s ok to close trades early if PA indicators reverse and original basis of your trade is invalidated, be sure to document your rationale. No trades this week. I didn’t see any good ones, and was hesitant due to S&P situation and end of year. I just did some scriptin. Good on ya, keep it up. I see you grabbed some materials from my and James16 PA threads. Smart move. Thanks for the great thread, I’ve really studied your main points but haven’t spent a lot of time yet going through all of the pages with the individual trades and questions people ask. Do you think there is value in doing that? It’s a pretty old thread so the setups would be invalid at this point. I have not been trading, I’ve just been reading a number of books and studying some stuff on youtube. I also have been writing Tradingview indicators for other people. I’ve not been trading due to - week off for vacation, then really crazy volatility in the markets, kind of scared me off the charts for a while. I’m also sort of in a bad state due to some stuff in my personal life - I’ve learned in the past that I make bad trades when I’m not in the right frame of mind.